“Don’t forget to bring a flashlight!” said the press release on STINAPA’s upcoming sunset hike to the top of the Brandaris. I was psyched – clearly this was going to be one adventurous hike –not only was it my first time to hike to the top of the hill in the Washington Slagbaai National Park but we would be descending at night. Roughly once a month STINAPA organizes a special hike, sometimes to the top of the Brandaris, other times a kaminata or walk along another beautiful park trail. This time a sunset hike was planned to the top of Bonaire’s highest peak – timed just right to see the sun hit the horizon at the top and consequently, the need for a flashlight – to make it back down to the exit. We met the group at 4pm at the entrance to the Washington Slagbaai National Park. People were milling about, excited about the adventure up ahead. “Does your light work?”, “Can I borrow a torch”, and “What kind of flashlight do you have?” were the most frequently asked questions amongst the hikers as they waited to enter the park. Time to go! Everyone jumped into their cars (some even carpooled) and drove onwards into the park behind the pick-up of STINAPA’s Chief Ranger George Thodé, aka Kultura, who was set to guide us up together with STINAPA’s National Park Manager Paulo Bertuol. After a 25 minute ride into the park we parked the cars at the bottom of the trail up to the peak of this Bonairean ‘mountain.’ With backpacks filled with water, sandwiches and, of course, the by-now notorious torch, the group set off behind the chief ranger. 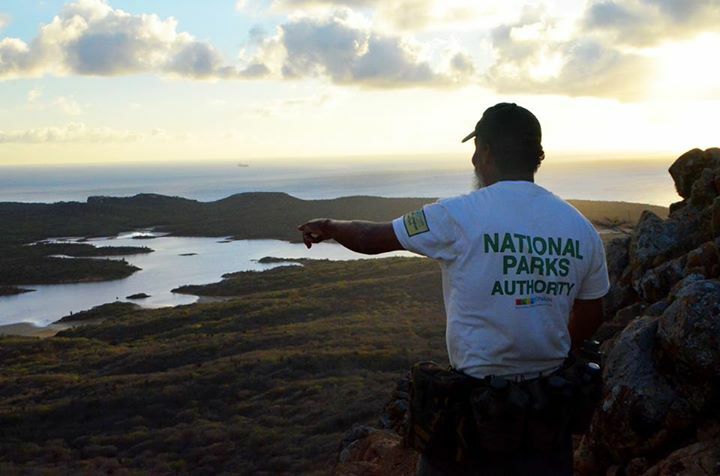 The pace was set and the quicker hikers closed in on front man Kultura as he explained about the park and Bonaire’s nature. The rear was brought up by Paulo. The going was quite easy, especially at the beginning, as we trekked through the landscape so typical of Bonaire – high cacti trees, dry wabi’s and red earth. The more we climbed, the sparser the vegetation, and the more stunning the panorama. After passing through a little green gate we looked up at the top of the Brandaris, seemingly hours away. With sunset time creeping up on us the pace was set again – up and onwards. Panting and sweating we arrived at the first outcrop of the hill – a striking view as a reward and a true scramble up ahead of us. We climbed, holding on the edges of the rocks with hands and feet, following a gutter in the side of the hill towards the top. At the top of the first hill a little ridge path gave way to another last climb to the true top of the Brandaris. A last heave and pull and we reached – just in time! Slowly but surely everyone made it up and sat down with a drink of water to enjoy one of the prettiest sunsets I have ever seen on the island. Sunset from the highest point on Bonaire!Sunset from the highest point on Bonaire! Curaçao was clear as day, right under the cloud that hid the sun as it descended. I had never seen our neighboring island that clearly outlined, and neither had Kultura. He explained that he had surely climbed the Brandaris more than most but had never seen this far before! Lucky us, to have hiked on a day so clear. As the sun hit the horizon and began its sinking path into the sea, it began to get chilly on top, and backpacks were strapped back on to ready us for the way back at twilight. With the last tip of orange gone we set off scampering down again. Twilight quickly gave way to darkness and the moon. With a night so clear the moonlight was bright and enough– for me- to see by. It was an amazing experience to clamber down a mountain by night. We waited at intervals until the group was complete and Paulo, the last man in the line, had arrived safely amongst us, before we set off down again. A stunning sight was looking back at the rest of the group as the night got darker. We descended fast with Kultura’s guidance and turning back saw a string of little headlight torches light the way down the hill like a bright twisting necklace. Easy does it though and once the hill was behind us we walked in unison back towards the head of the trail. I met some wonderful people along the way and had various chats with the different hikers this adventurous climb attracted. I loved the fact that the group was so varied in fitness and in age– showing that it is possible for most people to hike to the top of the Brandaris and descend back in darkness. Kultura told tales of a 94 year old Frenchman who had quickly ascended the mountain, and of an elderly Bonairean who had attempted the hike with his family. He made it to the top whilst some of his younger family members didn’t. With a revered salute to the hills of the park Kultura brought us safely back to the parking lot and to a jug full of ice-cold water. It had been a true success. The climbers loved it. Happy, and full of energy after such an adventure I left the park. I am sure to participate in these wonderfully adventurous STINAPA walks again!